Depending on your upbringing and past experience, setting boundaries in relationships may be easier or more difficult for you. Depending on your upbringing and past experience, setting boundaries in relationships may be easier or more difficult for you. Often if we have had a parent, guardian or other person in our life during childhood who didn't know how to set boundaries with us then we have to learn how to set boundaries in relationships. We have to learn when it is the proper time to set a boundary and how to find a balance in setting boundaries so they are not too weak or too strong. Step 1: Recognize and acknowledge your own feelings. In order to set effective boundaries, we must be able to know what it is that we are feeling. Did this person's critical comment make me feel bad? Is this person making me feel overwhelmed or drained? The problem with many of us who have weak or leaky boundaries in relationships is that we become so enmeshed, so encompassed by the other person's "stuff" that we have no idea that it is that we ourselves are feeling. By taking the time to break away, reflect, and really check in with yourself, you are then consciously making the distinct difference between yourself and the other person. Step 2: Recognize how your boundaries have been crossed. So now looking at your feelings, stop and recognize how your boundary has been crossed. Is this person always asking to borrow money from you but they never pay you back? Do you find yourself always answering your friend's text or phone calls late at night and it's causing you to lose sleep? Is this person always making critical comments towards you? Does this person always seem to have problems that you always have to help them with? Do you have a client who always shows up late for your appointments? So if the person is always borrowing money from you but never paying you back, then you may need to tell them that you are not letting them borrow anything else until you get paid back what you've already given. If it's a friend who is always texting or calling you late at night when you're trying to sleep, then maybe you want to tell them that you can't talk now cause you need to sleep -- or you can stop answering all together. If someone keeps making critical comments towards you, then you can tell them that you don't appreciate being spoken to that way and that you will not accept it. If it's a friend who seems to always have problems for you to listen to and it's draining your energy, then its probably time to be sure you say something like, "Hey, I know you're in pain, but I have some of my own stuff to do right now." Step 5: Voice it! 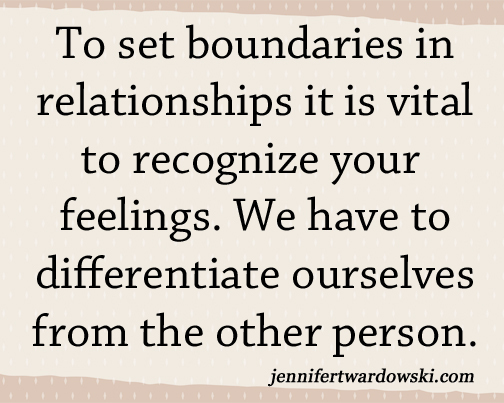 Make your boundary known -- communicate it to the other person. Keep in mind that if there is any backlash from the other person or if they want to argue, then it may be best to simply just walk away and focus on taking care of yourself. The reality is that if there is a backlash then the other person isn't respecting your boundary. If we acknowledge their disrespect by arguing with them, then we are giving them what they want: A weakness of our boundary. By acknowledging and focusing on their backlash we are then subconsciously telling them that we are not grounded within ourselves and confident in what we want. Step 6: Take care of yourself. If setting the boundary brought up any backlash or feelings of guilt, then be sure to take care of yourself. Go for a walk, exercise, be out in nature, etc. Do something to help yourself get re-centered and don't spend too much (or any) energy focusing on what happened. So even if someone else wants to talk about the "drama" of what happened, then just don't even go there. Tell them you don't want to talk about it, because when we do that we keep the stress and fear-based thinking alive.